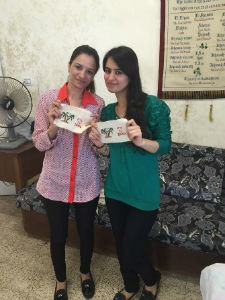 For many years Manara International has been attempting to assist Iraqi refugees (see JOR01). Much of it has revolved around helping them with food, shelter and encouragement. This project is about empowering the women, teaching them sewing and embroidery skills, which will help them in both the short and long term, wherever they end up. 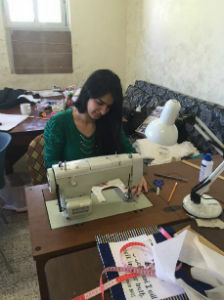 Manara wants to train 45-50 women per year to assist them to be able to earn small amounts of money and contribute to the income of their family. This helps them gain confidence, form strong relationships and gives opportunity for help to be given to them. The women are taught various skills and the product they produce is marketed and sold by Manara. The women are paid for what they produce after finishing the course. Some women come into the centre to learn and then sew as they love the fellowship the group provides, others work at home and get paid per piece for the work they do. They are free to start their own projects and do as much other sewing as they can. Some have commenced small sewing businesses. For some years BHW personnel have know of Manara and the leaders. In 2011 we were invited to visit and the first visit went ahead in 2012. Tt became obvious that there are huge needs amongst the poor and that Manara was doing a great work among them. In late 2013 we commenced partnering with them to provide assistance to these refugees. Following a visit by BHW's Field Director in mid 2016 this new project was approved and funding commenced in late 2016. Approximately 45-50 women who are struggling to survive in a country they have fled to. 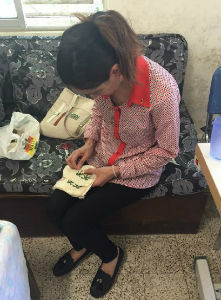 Many young women are forced out of desperate circumstances to resort to prostitution to survive. Their families are also beneficiaries from the income the women earn and from the increase in morale of their women. All of these women have lost a great deal in the last few years. They have lost jobs, homes, family members and their identity. They have experienced terrible things at the hands of ISIS in Iraq. They are traumatised, abused and fearful about the future. They are living day to day and hand to mouth until they are able to leave Jordan. This can take years. Some will never leave. It is a genuine, if small, attempt to take the Iraqi refugee issue beyond mere relief. It is helping women do something they want to do, creating a safe place for them to learn new skills, develop relationships and get help if they need it. It has a gospel component, many friendships are made and conversations had. The women absolutely love coming to the centre. It is a place of encouragement and hope for them. If they were not here they would be sitting at home doing nothing. The vision is to empower the women, giving them an opportunity to earn an income and grow in confidence after months and years of trauma and loss. The plan is to train as many as possible each year, up to 50 per year. They have taken the program to Fuheis across town and many other women are requesting that they start in their area. This is possible with the resources. This is training for life the women say. The budget for 2017 is US$5,500 which will fund some capital items (industrial sewing machine, sewing accessories, ironing board) and contribute to their operational costs (part-time helpers, rent, utilities). Safwan was all alone and unconscious from 4 till 7pm. No one helped him. After he woke up, he felt the terrible pain he was in and screamed for help until a car with two Christian men saw him and helped him, and took him home at 8pm. When they reached his parent’s home in Bartela, they knocked on the door and told his family, come get your son from the car. His parents assumed he was dead because what usually takes an hour took him from 11am to 8pm. He was in terrible pain and was bleeding. His family took him to the nearest hospital but there were no doctors at that time, only the emergency nurses. They gave him a bed and gave him pain relief medication to help him get through the night. The next morning the doctors found out that the bone in his left leg had been shattered and could not be repaired; he also suffered from two broken ribs and a broken shoulder blade. He stayed in hospital for 15 days and was then transferred to a hospital in Erbil. While there they operated on his left leg because he had lost bone and so they had to put a titanium plate in place. The plan was that at certain intervals decided by the doctor, he would have to replace the metal in his leg. However when it was time for the replacement surgery, ISIS entered the country and they had to flee. Now they are in Jordan they do not have the means to replace the metal and this is causing the wound on his leg to get infected. They are very afraid this might cause him to lose his leg. They cannot go back to Iraq and they cannot afford to do surgery here in Jordan. Another problem they face is that because of the trauma he endured and the depression he went through, the doctor prescribed anti-depressants and now he is dependent on them. He cannot go one day without them as he still suffers from depression now. He stays home and does not like to talk to people. Their financial situation is very hard. They cannot work in Jordan as it is illegal but they need money to pay rent for the apartment they live in and to buy medicine. 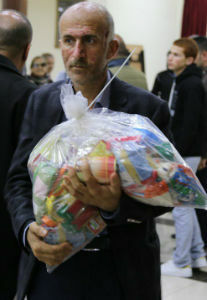 They live in a small apartment with their son, and also with Hala’s parents and sister. Niveen and her family were living in Mosel, they owned three stores there and were doing well for themselves. In 2006 there were threats against the Christian families but they did not give it any attention. However unfortunately their brother was one who was kidnapped. The kidnappers got in touch with them and told them either pay a ransom or we kill him. They only gave them one day for this. They sold whatever they had, gold and cars, to have enough money to pay the kidnappers. After a couple of weeks, he started feeling better and so they transferred him to jail because he entered the country illegally. It was at this time that he truly came to believe in Jesus Christ, all he had was the Bible and he read it day and night. After that, he was able to travel to Germany and from there go to Switzerland. When he arrived in Switzerland, he had absolutely nothing with him and had no one to talk to. It was a cold, snowy, winter night and his only option was to stay in a phone booth. While he was there, he prayed to God and told him you saved me all these times, I am sure you will save me again. To his surprise, a strange man and his daughter knocked on the door of the phone booth and he turned out to be an Egyptian pastor who is living in Switzerland. This pastor heard God tell him that there is a man who needs help. After that, he stayed at their house for a week and now he is a committed Christian who is always serving the church. His family, parents and sisters, stayed in Iraq in Qaraqoush and even bought a building there but soon they had to leave everything behind because ISIS came in and took everything away from them. Now they are in Amman waiting to receive their papers so they can immigrate and start their life all over again. These two ladies have truly inspired us to keep working hard. Though they have been through really tough and dark times, they are constantly cheerful and smiling. They keep repeating the phrase “God is faithful and God is good”. Their faith in Jesus Christ is the main reason for their smile and their hope.